I didn't translate the article in order, but I organized the most important parts. The petition has had over 7000 signatures overnight. 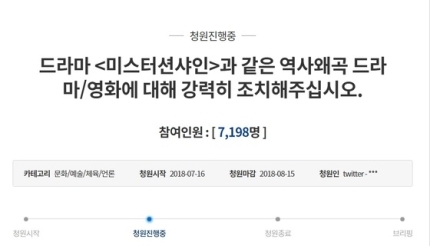 The netizen who wrote the petition argued that "movies and dramas are one of the most important medias in which the country's emotions and culture are shown. Mr Sunshine is obviously distorting history. It is a historical fact that there is a clear victim, trying to insert a certain background of ''he was obliged into this position" is a very dangerous act. This is because it gradually diminishes the consciousness of the problem and ultimately alleviates the weight of history itself, which is clear colonialism and cultural rule." 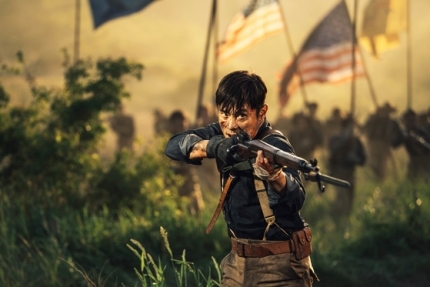 "In Mr Sunshine, the positions of the victim (Joseon) and the agressor (Japan) are reversed. Most of the villains are portrayed as Koreans. Disciples of pottery craftsmen appear as Japanese rather than Koreans, and the Joseon culture continues to be portrayed as 'uncivilized/barbaric'. 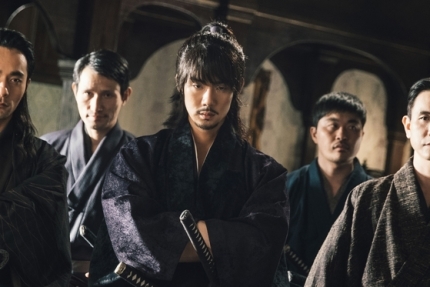 Instead of portraying Joseon as the victim that it is, the situation is shown as a self inflicted." - KES is criticized for the fact that a writer can just hire the best actors and the best visual quality directors and distribute them on Netflix, while being able to add almost anything to Korea's history. - Another pro Japanese character is Lee Wan Ik, his family dies of hunger and he is taking advantage of the situation of Joseon as a mean for his own success, selling his country to the Japanese. - The character of a Japanese gangster was originally set as the head of the Hansung branch of the Black Dragon Society. The Black Dragon Society is a real Japanese organization that was formed in 1901. As a right-wing organization of imperial Japan, it played an active role in the annexation of Korea and the Chosun colonial policy. This raised the question of whether the pro-Japanese paintings such as the support of the Black Dragon Society are being carried as the latter was forced to go to Japan. In response, the production team changed the 'black dragon society' into a virtual organization called 'silent society' and said, "There was no intention of pro-Japanese beautification. we are aware that we need to be more careful because the drama is dealing with a sensitive era of history. " [+3640, -1100] It is true that it was uncivilized, it is also true that we caved to the great powers. We shouldn't be ashamed of history but use it as a lesson for the future. So what if the government demands changes to a drama, will that change the future too? --> If KES is a commercial writer representing our country then just stick to dramas like DOS or Goblin. (didn't quite get this part but the commenter is saying the gun Kim Tae Ri is using didn't even exist at the time, and changing names doesn't make it any less pro Japanese). Do you not know the impact of a drama? It's not just broadcast in Korea is it? 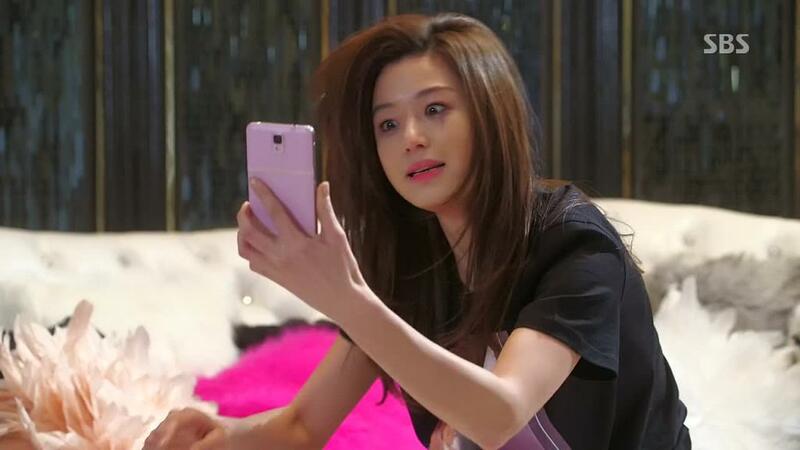 [+1813, -613] There are some historical errors, but overall it's okay. During that era foreign countries saw Joseon as an uncivilized country. [+1071, -440] In that sense, Korea must be full of gangsters, drug addicts, and murderers. it is true that Korea was more primitive than US, China and Japan at that time. If you are caught between great powers, you should've made use of good diplomacy but we were left behind because of a policy of isolation. Mr Sunshine reflects the current situation as well, which is why I feel bad. [+621, -22] The reason korean independance fighters are so respected is because there were so many pro japanese in our country but they still went and lost their lives for us. Please don't ridicule our independence fighters. No country has been sold more than ours. [+845 - 364] All history has both sides. There is no guarantee that any story will be true. Drama is the creation of a writer who exudes imagination with a certain event. This way, we can only get a piece of work that is compelling if we are good? Beautification is the worst distortion. Do you want to be a country like China or the Soviet Union?